Mikel Arteta is set to become only the third Spanish players to reach 200 games in the Premier League when Arsenal take on QPR. Cesc Fabregas and Pepe Reina are the only other two to reach the landmark but Arteta will be hoping that he will play a lot more games before he leaves England or retires. He first came to England in the January transfer window of 2005 when he signed for Everton on loan with a view to a permanent move at the end of the season to fill the gap left by the departed Thomas Gravesen. He was relatively unknown to English football even though he had a relatively successful spell in Scotland with Rangers but by the end of the season he was well known all around the country as he showed his fantastic passing abilities and his eye for a goal. He scored the first of his 33 goals for the club against Crystal Palace and was then signed by David Moyes at the end of the season for £2 million which now seems like a bargain. In his first two full seasons with the Toffees he won the Player of the Year award and it seemed to be a pretty easy choice with him scoring three goals and providing seven assists in the 2005-06 season. The following year he arguably had the best season of his whole career scoring nine times and finishing third in the assists table in the entire Premier League with 12. 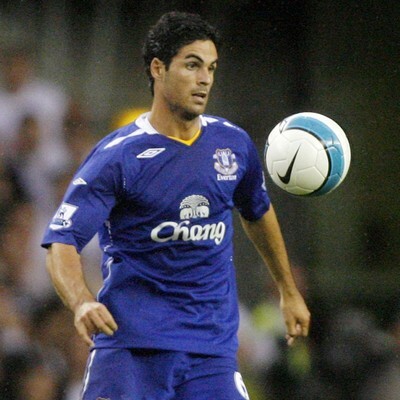 In my opinion, Moyes deserves credit for Arteta’s career in England because he had been playing as more of a holding midfielder for his previous clubs and was just sitting in front of the back four so he could play passes but Moyes changed his game and made him more of an attacking midfielder so his passes would create more chances for teammates to score. In his remaining years at Everton, he didn’t quite hit the same amount of goals or assists but he was still very consistent and was one of the most underrated players in the Premier League. The Everton fans loved him but I think a lot of other fans didn’t quite see how effective he was but in their defence, to see how good he is you probably have to watch him for a full 90 minutes. At the age of 30, it seemed to me like he was going to stay at Everton for the rest of his career but Arsenal reportedly offered £10 million for him. It must have been hard to take for the Everton fans that he got sold but in their manager and chairman’s defence they got a lot of good service out of him and made a profit of £8 million on him. He already has five goals for the Gunners and three assists which shows that his career is not coming to an end anytime soon. His free kick against Aston Villa was one of the best this season and with him already captaining the side in an FA Cup game against Leeds United, he could still play a very important part in Arsenal’s future.